New data obtained by CBC News suggests the range of electric cars is significantly impaired by extreme cold, but not enough to affect the commuting habits of most Canadians. 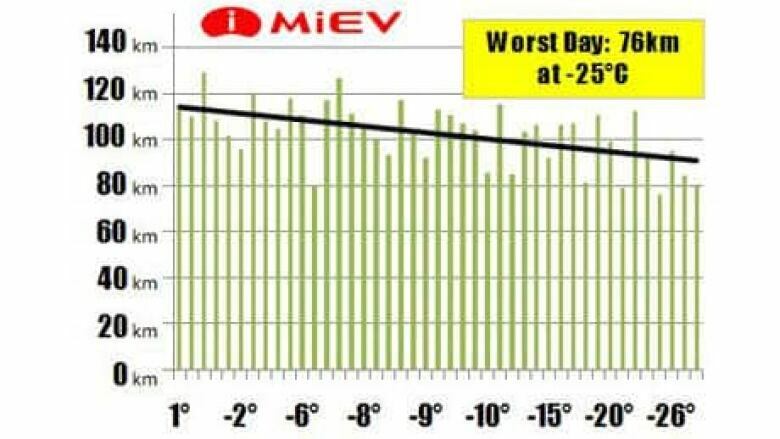 Winnipegger Ross Redman tracked the winter performance of his Mitsubishi i-MiEV. The self described "techno-geek," who builds circuit boards for a living, bought the first i-MiEV in Canada in December. He used the car's cabin heater every day, and drove it like he normally would. So far, he's impressed with the distances he can go. "Well, it performs really well! It goes like crazy, and when you stomp on it, it accelerates like mad!" Redman said Friday, at St. Andrew's Airport test track. "I drive around the city, go to work, I pick up the groceries, go to volleyball, and do all the normal things that people do in Winnipeg, and the range works just fine for me." Redman used the car's dashboard readings to create a daily log of his car's range. Every time he pulled into his garage to recharge his car, following his short urban commute from work, he would note his kilometres used and kilometres remaining. When he added them together, he came up with the car's "effective range," meaning how far it could go on a single charge, and compared that to daily temperatures this winter. He found the car's range this winter averaged 103 km — the maximum typical distance he could travel on a single charge. But on one of the coldest days of the year, on Jan. 20 when the mercury hit -25 C, the range dropped to just 76 km. The car's maximum range in ideal, warmer conditions is 155 kilometres. Mitsubishi says the finding are in line with what it expects. "You are going to notice some sort of drop, depending on the temperature, [especially] when you get into the minus double-digits." Ulmer adds that an extreme cold-weather range of 76 kilometres will work just fine for most Canadians, who commute just 30 kilometres on average, according to Statistics Canada. Neither Mitsubishi nor its electric-car competitor, Nissan, publishes winter testing results of its electric vehicles. Some prospective consumers worry that electric car batteries will not stand the test of time and may need to be replaced. But both companies stand by the batteries, with Mitsubishi offering an eight-year warranty for its electric car battery. Mitsubishi doesn't expect most will need to replace the battery, but i-MiEV owners will notice a 70% reduction in the batteries capacity in about 10 years. CAA Manitoba says the battery for electric vehicles is about one-third of the purchase price, and expects that will drop over time. The i-MiEV sells for $32,000, while the Nissan Leaf starts at $38,000. Redman says his car can be "filled" with electricity for about 80 cents a day. He figures he saved about $100 in January just by avoiding the gas pumps. Mitsubishi says the car be charged from empty in 20 hours with a standard 120-volt plug. When charged with a "fast-charging" 220-volt plug — the type a laundry dryer uses — the time is cut to seven hours. Even faster "level 3" charging stations, that use 440 volts, can charge the iMiEV or the Nissan Leaf in 20 or 30 minutes, according to Manitoba Hydro.